Dr. Linda Molesworth does not have an electric bill 10 months of the year due to the solar panels on that barn at her Fresh Meadows Farm. The idea of “going green” can apply to many practices that help our environment on a local and global scale. From recycling to turning the lights off to reusable grocery bags, everyday people can make everyday changes that make more than just a local impact. 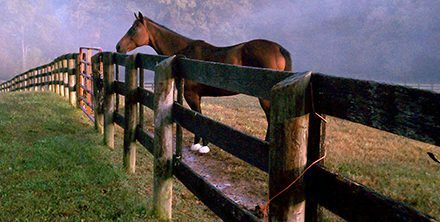 Many horse farms in Maryland have taken the “going green” idea a step further by fencing off streams, using proper pasture management practices and installing clean energy sources such as solar panels. For this year’s Farm Fix-Up issue, The Equiery polled its readers to find out who has solar panels on their farms and what they think of this clean energy product. By definition, “solar power” is the conversion of sunlight into electricity. The French physicist Edmond Becquerel first discovered the process of converting sunlight into energy in 1839. It took more than a century to turn his discovery into the technology that we now think of as solar power clean energy. The process of converting sunlight into electricity can be done either directly using photovoltaics (PV) or indirectly using concentrated solar power (CSP). PV systems convert light into an electrical current whereas CSP systems use lenses or mirrors and a tracking system to focus a large area of sunlight into a small beam. 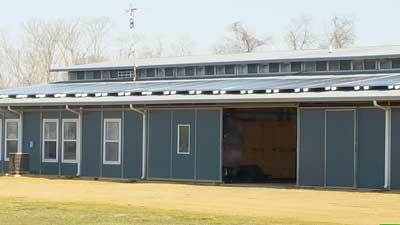 What we think of as “solar panels” for small-scale use (i.e., homes and barns) fall under the PV category. Solar panels can be as small as a single cell used to power a calculator, or as large as solar power utility plants. Jane Seigler of Dressage at Sundown leases the solar panels instead of buying them up front. According to Maryland’s Renewable Portfolio Standard (RPS), 2%, or about 1,200 megawatts, of the state’s energy must come from solar power by 2020. In 2013, the RPS goal was 136.5 MW. By December of that year, according to the PJM GATS reports, Maryland was producing 158 MW. The majority of that power was through utility plants (67 MW) and commercial sites (64 MW), which includes most horse farms. The residential scale was 28 MW. The U.S. Department of Energy reports that on the national scale, the amount of solar power installed in the U.S. increased from 1.2 gigawatts in 2008 to 21.3 GW by the end of the first quarter of 2015. That is enough electricity to power 4.3 million average homes. More specifically, the U.S. Energy Information Administration (EIA) predicts that the planned utility-scale solar additions in the U.S. for 2016 will be 9.5 GW, which will be the highest growth of any single energy source (including natural gas, wind, nuclear, hydro and petroleum). In 2015, there was a reported 3.1 GW growth in solar power. Note that these numbers do not include residential or commercial solar sources. And as the technology to convert the sun’s power into electricity becomes cheaper, so has the cost of installing solar panels on the residential and commercial scale. The U.S. EIA states the average cost of installation is between $15,000 and $29,000 for a 4 KW to 8 KW system. However, EIA also stated that fewer companies now report on the actual costs for specific types of PV cells and modules due to “consolidation and changes to strategic planning of companies in the U.S. solar photovoltaic industry.” Which makes us wonder if the competition within the solar industry is helping or hurting the average consumer. The PV system that is commonly used on farms here in Maryland starts with the actual solar panels that absorb sunlight and covert it to electricity. The solar inverter changes the electric current from DC to AC. Other electrical equipment, cabling and mounting equipment is needed as well. Once the electricity is captured, where it goes is up to the farm owner. Some systems are used to power a specific building or home while others connect several buildings on a single property. These systems can also be grid-connected, meaning any excess power goes into an electrical company’s “bank” to be used by customers who might not have solar panels. Rita Simpson (Holiday Stables) reported her panels should be paid off in five years after installation and has already seen over $1,000 in savings for the farm’s monthly electric bill. Stand-alone systems are also available, which would keep the solar power source off-grid so that the property owner is the only one with access to the power generated. When Dr. Linda Molesworth of Bay Equine Service and Fresh Meadows Farm in Huntington installed her solar panels in 2010, the option of being grid-connected was not available, thus any energy created by the panels on her farm stays on the farm. “Ten months out of the year I do not have an electric bill,” she reported. Although it may seem that the farm owner must buy the panels up front, there are companies who lease the panels instead; sort of like the solar company renting space on your farm. 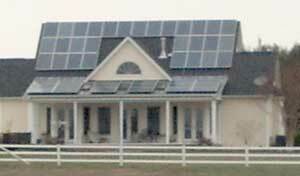 Solar City is one such company here in Maryland whose name came up a few times during our survey. Dressage at Sundown (Laytonsville), Roundabout Farm (Leonardtown) and Periwinkle Farm (Spencerville) all have 20-year leases through Solar City. LuAnne Levens (Periwinkle Farm) expects to see a 25% reduction on her electric bill from the solar panels on her barn. One of the main tag lines for companies selling solar power systems is that not only are they healthy for the environment, but that they “pay for themselves.” However, the claim that the energy created pays for the solar panels in a timely fashion has had mixed reviews, according to our survey responders. Steve Sisterman of Roundabout Farm reported that through Solar City they see about $170 worth of power produced each month. Their panels were installed on the roof of the primary house in 2012. LuAnne Levens of Periwinkle Farm put panels on the barn roof last October and said she expects a 25% reduction on her electric bill each month. Her panels are also leased through Solar City. Rising Star Farm in Woodbine reports on what may be the quickest return on its investment. They expect the panels that were installed in 2012 by Solar Energy World will be completely paid for in just five years. 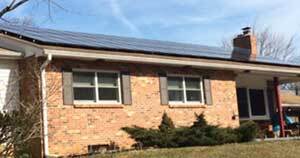 The panels at Brooke Grove were installed through Greenspring of Timonium (which is no longer in business) and Dr. Mess started receiving credit checks two years after they were installed on the indoor arena roof. “It was a huge investment up front but I consider it a great benefit to the farm,” he said. Here in Maryland, a Maryland-Eligible Renewable Energy Credit (REC) is equal to the environmental attributes associated with one megawatt-hour (1,000 kilowatt-hours) of energy generated by the solar panels. The Maryland Energy Administration (MEA) states on its website, “For example, if a solar array produces 4,000 kWh over the course of a year, the system owner will receive four Solar RECs.” This monetary value is typically used to help push down the cost of installing the panels through credits over a period of time. In order to get RECs, a facility must register its panels with Maryland Public Service Commission once the panels are in place and the system is actively generating electricity. The company that installs the panels should be able to help with the registration process. Dr. Molesworth conducted her own audit five years after All In Energy Solutions installed her panels. “At that time, along with various grants and energy credits, they were halfway paid off,” she said. She estimates by 2020, with the money she has saved in electric bills, the panels will have paid for themselves. Louisa Emerick (Elkton) does not expect to see the full return on the panels placed on her home and barn for at least seven years from installation. In 2011 Louisa Emerick put 14 panels on her barn roof and 54 on the roof of her house in Elkton. She does not expect to see the full return on those panels until 2018. Harold Goldstein has a three-acre solar field next to his main barn in Highland. His estimate from Sunpower Corp was that the panels would pay for themselves in about seven to eight years from installation, which was in January 2010. Although the cost involved with installing solar panels is dropping, it is still a considerable investment. Most of the incentives, tax breaks and grant funds available only apply if the farm owner purchases the panels outright versus renting or leasing them from a solar company. Simpson pointed out that when you rent the panels, it is the solar company that receives any incentives, not the farm owner. She received over $19,000 through grants towards the $152,000 cost of installing the panels at Holiday Stables. The Maryland Energy Administration (MEA) manages grants, loans, rebates and tax incentives geared towards helping Maryland’s goals in energy reduction, renewable energy, climate action and green jobs. Incentives are broken down into Residential, Business, State, Local and Nonprofit and Transportation. Most of the incentives for farms fall under Residential or Business. Steve Sisterman (Roundabout Farm) highly recommends the lease versus buy option for solar panels. These programs include the Clean Energy Production Tax Credit, Commercial Clean Energy Grant Program and the Maryland Statewide Farm Energy Audit Program. For a complete list of programs offered through MEA, applications and more information, go to energy.maryland.gov. Please note that many of these programs have start and end dates for installation and service. At the federal level, the Business Energy Investment Tax Credit will allow a 30% tax credit for installed solar energy systems placed in service after December 31, 2016. The Modified Accelerated Cost-Recovery System allows businesses to recover investments in solar technologies through depreciation deductions as five-year property. The Federal Residential Renewable Energy Tax Credit allows taxpayers to claim a credit of 30% of qualified expenditures for installing the solar panel system as long as it serves a residence and it must be placed in service by December 31, 2016. For more information on Federal grants and tax credits, visit the U.S. Department of Energy at energy.gov. Even with tax breaks, reasonable loans and other incentives, are solar panels worth the initial investment? Our survey responders mostly said yes, with a few wishing they had done a bit more research before selecting a specific company. Seigler absolutely recommends Solar City; “Love them! Solar City has been great to work with and we are saving a lot on power.” Sisterman agreed, saying “Definitely” when asked if he’d recommend Solar City to others. And Levens loves the fact that Solar City’s tech people are available for help 24/7. Michele Wellman was not satisfied with the company she used for the panels at By Chance Farm and wishes she had not put the panels up in the first place. “I honestly wish I’d never done it or had worked with a different company who was fair and more up front with their intentions,” Wellman said of Renewable Energy in Timonium. While the idea of going green and clean energy is very appealing, the biggest recommendation our survey responders gave was to do your research before committing to any one company. More and more solar companies are springing up while others have fallen by the wayside. Luckily for farm owners, the competitive nature of the solar industry makes it a buyers’ market!